Water ionization is achieved through natural minerals which offers alkaline pH up to pH9.5, antioxidants and Micro-clustered water. Benefits: Mineral water ionizers offer in comparison to electrolytic water ionizers a wide range of minerals into the water, such as a major increase of ionic magnesium. Together with other properties such as hydrogen and hydroxyl ions (OH-), Mineral Water Ionisers facilitate increased hydration, elimination of body acidity, improved detox, countering inflammation, increase of energy levels and promote general improvement of health. Limitations: in comparison to the more expensive electrolytic water ionizers, the mineral water ionizers offer less choices of pH levels, the pH and hydrogen levels are decreasing from the beginning of usage as the minerals are getting used up. Further the potency of hydrogen, alkaline pH, the red-ox potential is not as strong. Not like with electrolytic water ionizers which produce electrons which benefit in rebooting clogged up blood cells, the mineral water ionizers do not offer electrons. 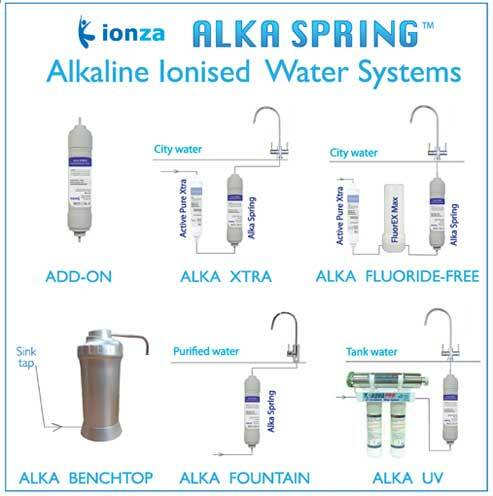 Advantages: In our opinion when the budget does not permit to purchase a more expensive Electrolytic water ionizer, the mineral water ionizers of the Alka Spring range offer plenty of health promoting benefits for a great value-to-money-ratio.